This Ring Jet creates a stunning visual effect for your pond or water garden, while also adding a valuable aeration function for a healthier pond. Attach optional telescoping risers and fountain heads to the center of the Ring Jet to create a wide array of stunning effects. The performance of the Ring Jet is directly affected by the GPH pumped throught the fountain head. For a higher and wider spray pattern, a higher GPH/PSI pump is required. 21 jet nozzels with O-Rings and a plastic male pipe plug. Adjustable nozzles direct spray pattern outward, in-ward or in a spiral pattern. 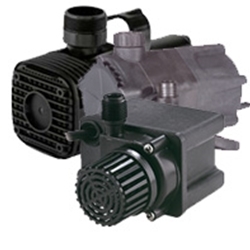 Small submersible epoxy-encapsulated pump designed for light duty water recirculation. Ideal for statuary and water displays. This compact 70 GPH pump features a 1/8" MNPT discharge, 4.5' shut-off head capability, screened inlet, and 6' power cord. The PE-A is not recommended for aquariums, swimming pools, and fuel oil transfer.